The most progressive sports-business sedan with athletic design, powerful dynamics, unparalleled agility and superior comfort. The intelligent car with unprecedented connectivity: BMW gesture control, BMW display key, parking assistant, remote control parking, wireless charging and advanced BMW head-up display. Efficient lightweight construction lowers the weight by up to 70 kilograms as compared to the predecessor. The all-new BMW 5 Series was launched in India today. 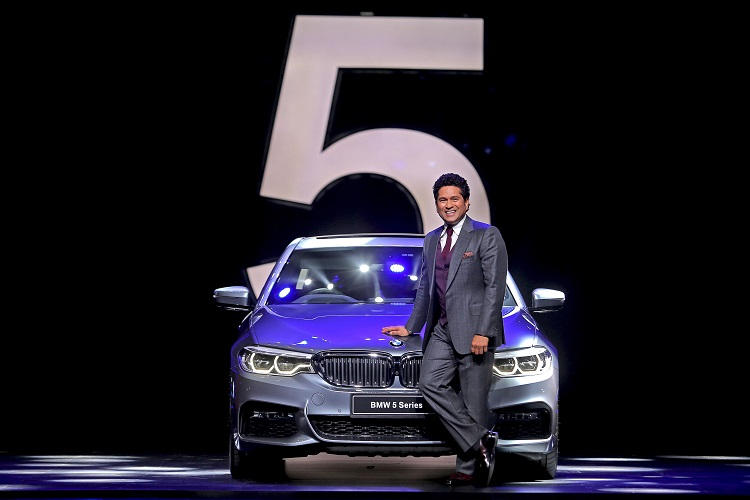 Seventh generation of the premium sedan was unveiled by the legendary sportsman, Mr. Sachin Tendulkar. Locally produced at the BMW Plant Chennai, the all-new BMW 5 Series will be available in diesel and petrol variants at all BMW dealerships across India from 1 July 2017 onwards. The all-new BMW 5 Series adapts perfectly not only to an active lifestyle but also to personal taste. The three exclusive design schemes – Sport Line, Luxury Line and M Sport offer options that meet individual requirements. Sport Line celebrates the gust of adrenaline with sporty styling shines the spotlight on the car’s dynamic character and stands out with numerous trim elements in high-gloss black, special colours in the interior, sports leather steering and light-alloy wheels in a bi-colour polished finish. The Luxury Line indulges movement in style with elegant contours and endows elegance through its fine design elements of high-gloss chrome and matching wheels, aluminium door sill plates, sports leather steering wheel, exclusive colours for the ambient lighting and chrome edging for the air vents all catch the eye. In the M Sport package, the bestows masculine character distinguishing itself as an elite sports model with M aerodynamic package, M light-alloy wheels, M badging , an extremely sporty cockpit design with M leather steering wheel and comfort seats in the front with Exclusive ‘Nappa’ Leather upholstery as standard. The all-new BMW 5 Series is available in three diesel variants – the BMW 520d Sport Line, the BMW 520d Luxury Line and the BMW 530d M Sport and in one petrol variant, the BMW 530i Sport Line, which are locally produced. *Price prevailing at the time of invoicing will be applicable. Delivery will be made on ex-showroom. Ex-showroom price (inclusive of GST (incl compensation cess) @ 43% as applicable in New Delhi but excludes Road Tax, RTO statutory taxes/fees, other local tax/cess levies and insurance. Prices and options are subject to change without prior notice. For further information, please contact your local Authorized BMW Dealer. The all- new BMW 5 Series is available in Alpine White (non-metallic) and in the following metallic paintworks: Black Sapphire, Imperial Blue and Cashmere Silver. The additional metallic paintworks for Luxury Line range are Jatoba and Bluestone Metallic. The exclusive metallic paintworks for the M Sport range include Mediterranean Blue and Carbon Black. The range of fine upholstery combinations in the all-new BMW 5 Series has Leather Dakota as standard and includes Canberra Beige exclusive stitching / piping in contrast | Canberra Beige and Cognac exclusive stitching /piping in contrast | Black. The Sport line has exclusive offering of Leather Dakota Night Blue exclusive stitching / piping in contrast | Black and Leather Dakota Ivory White exclusive stitching / piping in contrast | Black/Dark Coffee is exclusively available with Luxury Line. The BMW 530d M Sport is available in Exclusive leather ‘Nappa’ Ivory White exclusive stitching / piping in contrast | Blak/Dark Coffee and Exclusive leather ‘Nappa’ Mokka exclusive stitching / piping in contrast | Black. The all-new BMW 5 Series continues to break the innovation barrier in its class with game changing technologies such as BMW Gesture Control, Remote Control Parking with BMW Display Key, Wireless Charging, Parking Assistant with Surround View and the next generation BMW Head up Display. Hands do the talking in the all-new BMW 5 Series with the unique Gesture Control which is part of a rigorously thought-out operating concept that recognizes six pre-defined hand movements for control of a number of functions. This includes volume control, accepting or rejecting phone calls, acknowledging check control messages, closing an information window, changing the camera angle etc. There is also the option of pairing a specific gesture with an individual choice of function. With the Remote Control Parking and BMW Display Key with touchscreen, a driver can manoeuvre the all-new BMW 5 Series into a narrow parking space from outside the car. The driver activates the remote-controlled parking function from outside the vehicle via the BMW display key. Besides other information, the smart key also displays service reminders, cabin temperature, mileage range and fuel level. All acceleration and braking actions are monitored and controlled by the Park Distance Control (PDC), the Parking Assistant with the Surround View camera, while the engine can be started and switched off by remote control. Surround View shows a bird’s-eye view of the driver’s car as well as a three-dimensional image of the traffic situation. Any obstacles or other road users that suddenly appear can be spotted even earlier in this way. The smartphone holder integrated into the centre console which allows inductive, Wireless Charging for mobile phones and the BMW Display key. The all-new BMW 5 Series will make a mature, confidently stylish and dynamic impression at every opportunity. The formal and precise design combines presence, aesthetic appeal and functionality in equal measure. The all-new BMW 5 Series brings together two traditional BMW design elements that lend the car a forward-surging character, and expressive undeniable muscularity. Even when standing still, the BMW 5 Series creates a powerful impression. The lightness of the new-generation 5 Series (it cuts the weight of its predecessor by 70 kilograms) is clear not only in its design, but also its dynamic responses. The new model therefore remains the quintessential sporting business sedan. The impression of lightness and sporting prowess continues into the interior, with its large display, sparingly arranged controls and uncluttered surfaces. The interior of the all-new BMW 5 Series strikes a fine balance between sporty driver focus on the one hand and sophisticated elegance on the other. Top-class materials, supreme build quality and attention to detail, a great feeling of spaciousness and new technologies in abundance combine to offer both driver and passengers comfort and driving pleasure of the highest order. In typical BMW style, the cockpit is angled towards the driver to put all controls within reach and facilitate intuitive driving. Ambient Lighting package with six dimmable designs creates an atmosphere for every mood. The increased precision and the quality of finish and revolutionary display and control concept makes the all-new BMW 5 Series an ideal business sedan. The all-new BMW 5 Series offers noticeably more headroom in the rear as well as an increased boot capacity of 400 litres (integrated emergency spare wheel). The car is much roomier inside, something which can be attributed not just to the lowered instrument panel and free-standing display, but also to the cabin’s enlarged dimensions, particularly in terms of elbow and shoulder room. Passengers in the rear now have more space to spread out, thanks to the increased knee room and extended legroom, while the optimised design of the door cut-outs makes getting in easier than ever. Finding the sweet spot between emotional richness and functional appeal – and seamlessly merging the digital and analogue worlds – was the aim of the BMW designers. In short, everything possible was done to ensure that drivers feel at home inside their car. The all-new BMW 5 Series is equipped with an extensive range of BMW ConnectedDrive systems like the BMW iDrive with BMW Navigation Professional (with touchscreen), Park Distance Control and Parking Assistant with Surround View Camera that provides a 360-degree view, BMW Apps, Connectivity through Bluetooth and USB/AUX IN connectivity. BMW Head-Up display in the M Sport variant of the all-new BMW 5 Series is now 70 percent larger than before resulting in even more relaxed driving with complete concentration on the road ahead. The Rear-seat entertainment Experience equipment guarantees great entertainment for the rear seats. It includes two 10” colour displays on the rear side of the front seat backrests. It also includes a Blu-ray player, an HDMI connection for mobile devices, as well as various connections for MP3 players, game consoles. Up to three sets of headphones can be connected via the integrated wireless interface. The innovative petrol and diesel powered engines from the BMW EfficientDynamics family offer considerably more spirited power delivery as well as spontaneous responsiveness even at low engine speeds. Thanks to their unrivalled BMW TwinPower Turbo technology, they meld maximum power with exemplary efficiency, and all comply with the BS IV emission standard. The three-litre six-cylinder diesel engine of the BMW 530d produces an output of 195 kW / 265 hp and a maximum torque of 620 Nm at 2,000 – 2,500 rpm. The car accelerates from 0 -100 km / hr in just 5.7 seconds to a top speed of 250 km / hr. The two- litre four cylinder petrol engine of BMW 530i produces an output of 185 kW / 252 hp and produces a maximum torque of 350 Nm at 1,450 – 4,800 rpm. The car accelerates from 0 -100 km / hr in just 6.2 seconds. The two-litre four cylinder diesel engine of the BMW 520d produces an output of 140 kW / 190 hp and produces a maximum torque of 400 Nm at 1,750-2,500 rpm. The car accelerates from 0 -100 km / hr in just 7.5 seconds. The eight-speed Steptronic Sport automatic transmission performs smooth, almost imperceptible gear shifts. At any time, in any gear, the transmission collaborates perfectly with the engine, enabling it to develop its full power and efficiency. For even greater driving pleasure, the eight-speed Steptronic transmission is available with steering wheel paddle shifters. Overwhelming driving comfort of the all-new BMW 5 Series is a result of the Dynamic Damper Control that improves ride quality and suspension by stabilizing all irregularities of the road surface. Using the Driving Experience Control switch, the driver is able to choose between different driving modes to suit the driving conditions (Comfort, Sport, Sport+,ECO PRO and Adaptive). The all-new BMW 5 Series provides unparalleled performance coupled with cutting-edge Safety technologies. BMW’s exemplary safety provides optimal support in any situation with six air bags, Anti-Lock Braking System (ABS) with brake assist, Dynamic Stability Control (DSC) including Dynamic Traction Control (DTC), Cornering Brake Control (CBC), Hill Descent Control (HDC), Side-impact Protection, Runflat tyres (RFT) with reinforced sidewalls, electronic vehicle immobiliser, crash sensor and integrated emergency spare wheel. With BMW EfficientDynamics, the all-new BMW 5 Series is equipped with the most comprehensive technology packages to reduce fuel consumption and increase performance. Intelligent Lightweight Construction in the body leading to weight savings of upto 70 kilograms as compared to the predecessor. Aerodynamic excellence and the accompanying reduction in fuel consumption are guaranteed by details such as the side air blades on the tailgate and the air curtain integrated into the air inlets at the front. These measures are aided by additional features such as the 50:50 weight distribution, low centre of gravity, intelligent lightweight construction, automatic start/stop function, ECO PRO mode, brake energy regeneration, electric power steering and more. BMW Service Inclusive and BMW Service Inclusive Plus are optionally available with the all-new BMW 5 Series. These service packages cover all routine service and maintenance work with a choice of plans from 3 years / 40,000 kilometres to 10 years / 2,00,000 kilometres. These include original BMW parts required for routine service work irrespective of how many times the service is done. The all-new BMW 5 Series also comes with optional BMW Repair Inclusive that covers the car additionally from third year of operation to maximum sixth year, after the completion of the standard two-year warranty period. Thus, the car is covered for warrantable repairs for up to six years without any mileage limitations. Together, these packages provide complete peace of mind and freedom to enjoy unlimited driving pleasure.